Simply One of a Kind: Yum! It's odd how different stimuli spark ideas. 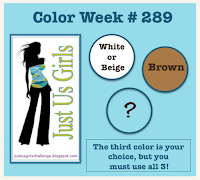 When I saw that the challenge at Just us Girls was these colours, I immediately thought of these stamps from Unity. 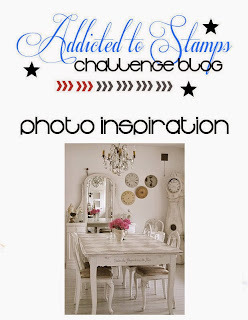 ...plus the Picture Inspiration from Addicted to Stamps . A hint of colour from the flowers, the colours of the clocks on the wall and the criss cross design on the table top! I'm not sure of the make of the embossing folder, but it's quite a large one about 5"x7". The image was coloured with a variety of alcohol pens, and cut out before mounting on a rectangle cut with a SSS stitched rectangle. The sentiment panel was cut with a Lil Inkers die. 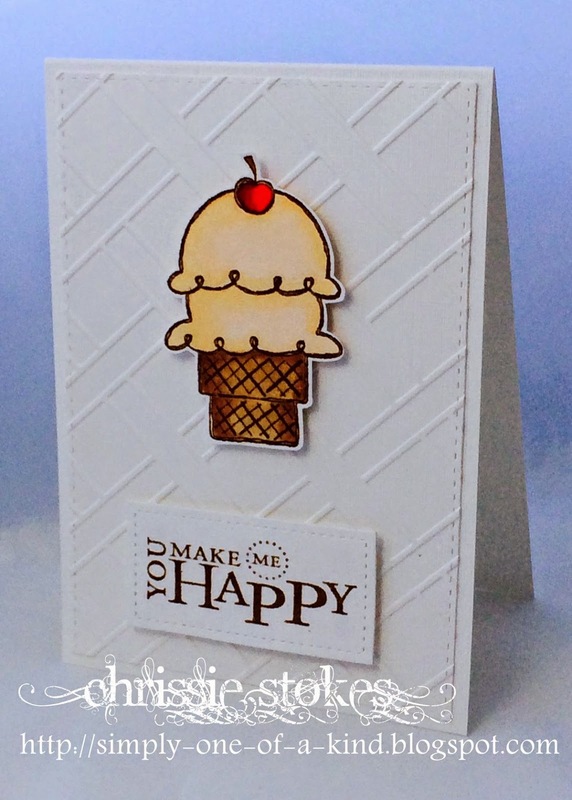 That ice cream and the rest of the details on your card are perfect for all three challenges. Adorable ice cream cone! Fun card - Thanks for joining in at JUGS! Love how the embossed texture echoes the waffle cone! So glad you joined us at CASology this week, Chrissie! Can you please tell me what set the ice cream cone is from in Unity's collection? Thank you! It is probably retired now, as it was from the June kit of the month in 2009! A few singles from that month are still available but not the cone sadly. If you contact Unity they may be able to help you. You've studied that photo inspiration in superb detail Chrissie and love how you've pulled those elements together to create your card. Stunning and CAS as ever. Love it. I do like the way you've combined these challenges - the ice-cream and the cherry on top is super. Thanks so much for playing along with The Male Room this week! Great card combining these challenges. I love seeing and hearing how each of us is inspired by the inspiration given. This is one yummy card - that cherry positively glows! Thanks for linking up with us at ATSM, Chrissie! What an adorable card! Great job of combining those challenges! Thanks for joining us at Just Us Girls! Adorable! Love the pop of red in your cherry on top! Well now I want ice cream! This is so cute and I love the color combo you chose! Thanks for playing with Just Us Girls!